How can Amazon help the sellers in increasing daily sales? How does Amazon help in increasing your daily sales? Amazon has been helping various businesses for nearly 20 years for increasing their daily sales. It has given excellent opportunities to every size of business,small, medium or large to increase their sales across the world. With the increase in its popularity, it has become the center of attraction for various businesses for promoting their brand on the internet. Amazon gives businesses an opportunity to have their own online store. Through the Amazon store, sellers can easily promote or brand their products. Amazon does not restrict the sellers to the local market alone, they have global customer access and the products can be sold across the horizons. With an Amazon accounts, sellers are able to list the products online and sell it to a wide range of customers. The demand for online shopping is on the peak and people prefer online stores for their daily shopping needs. Positively, this has been an innovative way to increase the daily sales. Amazon encourages customers to add reviews to their shopping and shipping experiences. Nearly 80 percent of the online shoppers trust the reviews while purchasing products online. Customers go through the reviews and then choose the product. Gaining the best review would help you earn reliability and it helps the customers to understand the features and functions of the product. Amazon also ranks the products based on the number of positive reviews. Undoubtedly, good service and great products gain the best review which in turn helps you to extend the daily sales. The new sellers on Amazon portal enjoy the benefits offered by Amazon sponsored products. It helps the sellers to display their products on top of the search results. This is an amazing marketing strategy used by Amazon to boost the daily sales of every business. 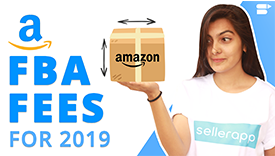 Apart from these benefits, Amazon also offers discounts and coupons, marketing inside and outside Amazon, hassle-free payments, Buy Box concepts, SEO optimization and much more to enhance the daily sales strategy of the seller.